Follow these Tutorials and you can easily maintain your M1 Garand. Each article has easy to follow instructions and detailed photos. Maintaining your M1 has never been easier. 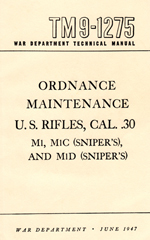 We have prepared two of the standard M1 Garand manuals for your use. The two are the TM9-1275 and TM9-1005 manuals. High resolution versions are also available. A C&R FFL03 license will legally entitle you to acquire firearms, classified as curios or relics. Read this tutorial to learn more about this license and how to apply for it. This license is issued by the BATFE. The Raw Linseed Oil Kit contains everything needed to apply a new finish to your rifle stock. M1 Garand Clip latch spring. Made to the US Army's spec for the M1 Garand. Made in the USA. M1 Garand Hammer Spring. A new USGI spec hammer spring helps reduce lock time and helps with reliable function of the rifle.